Anna Weatherley has been designing and producing hand-painted porcelain in Hungary for 26 years. When Princess Diana visited Washington, D.C. she was commissioned to design a pair of hand painted cachepots for her as a gift; the pattern was based on British botanical art. In 2008, she created a 75-piece dinner set collection for the private quarters in the White House. In 2011, Anna Weatherley was commissioned to create a collection of dinner plates for the dinner at The Buckingham Palace for The Prince of Wales. Since 2014, Anna Weatherley has been collaborating with the Neue Galerie in New York creating several hand painted collections for museum. In 2015, Anna Weatherley created a special collection of hand painted porcelain decorative objects for the White House Historical Association. The designs are based on the flowers planted in Jackie Kennedy’s Rose Garden of the White House. In May 2016, Chris Wallace, Fox 5 News, interviewed Anna Weatherley on national television at her studio. In 2016, The White House Historical Association published the book, “Official White House China from the 18th to the 21st centuries” featuring the dining room dinner service designed by Anna Weatherley, “the Magnolia Residence Service”. In 2016, the new book, “Blair House, The President’s Guest House” by William Seale was published. Anna Weatherley’s specially designed hand painted porcelain is photographed in the following rooms: The Front Drawing Room, The Library and in the Jackson Place Sitting Room. 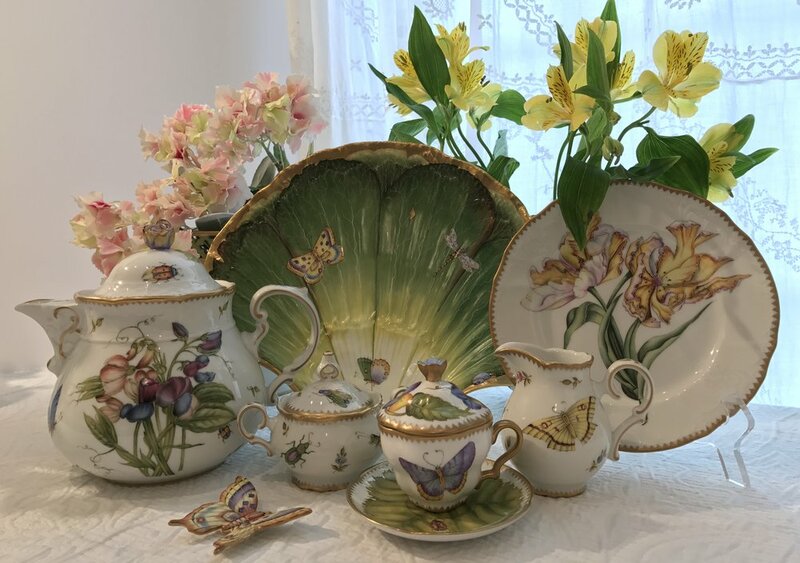 A new exhibition opened in December 2016 at the Historical Decatur House in Washington, D.C. where Anna Weatherley’s Hungarian hand painted porcelain is on display. All the porcelain objects are hand painted by a group of very highly trained master painters. The style is a classical free hand painting, but the result is not a “traditional” porcelain pattern. The number of designs are based on 17th, 18th century botanical art and are signed by the painters. This method of painting is a “dying art form,” the product of long hours of work on each object. The fine shading, the small brush strokes, the intricate details are result of very time consuming process. No mass produced decal design can be compared with these hand painted images. This large variety of patterns can be coordinated with contemporary and traditional interior décor as well. Through the years, a number of magazines have featured Anna Weatherley Designs, such as Architectural Digest, Veranda, Vanity Fair, Southern Accents, Elle Décor, Washington Post, Traditional Homes, House and Garden, Modern Bride. Town and Country, Ritz Hotel Magazine, Victoria Magazine, Florida Designs and other regional publications in the United States.